The secret of Valve's third big Steam living room announcement may have been revealed in a patent that was filed four years ago. With two out of three of Valve's big "living room" announcements out of the way, all eyes now turn to the third and final secret, set to be revealed on Friday. 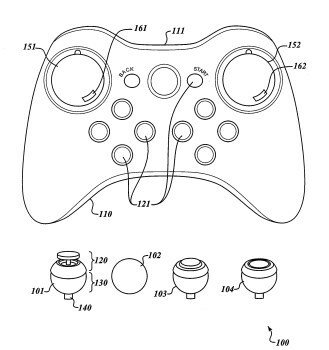 But it's possible that Valve has already tipped its hand, thanks to a patent application for a "Video game controller having user swappable control components" that was filed back in November 2009. "A game controller is provided. One or more main control input interfaces on the game controller consist of generalized sockets," the patent abstract states. "A variety of modular input interfaces can be plugged into these sockets. Hardware specific to the input type of the modular input is contained within the modular input itself, and plugged in via an interface. This allows for dual analog sticks, a combination of analog and trackball, or further any combination of touchpad, directional pad, or additional components." Speculation that a controller will be the final piece of Valve's puzzle is driven by a few factors. The patent filing, for one, and the fact that it's a rather natural progression: OS, box, controller. In January, Valve big bopper Gabe Newell specifically mentioned "a controller that has higher precision and lower latency" while talking about Valve's internal plans for a Steam box, and the Steam hardware beta announced today states very plainly, "Valve Corporation... has developed and produced prototypes of entertainment system hardware and software, including a set-top box running custom software and a game controller (collectively: 'Beta Products')." We won't have to wait very long to find out, as the final Steam countdown is 44 hours and change from hitting zero, but in the meantime, while we wait with nothing better to do, I think this makes a pretty compelling argument. Are you convinced?